Lilith Saintcrow's "Dante Valentine series"
Lilith Saintcrow is the author of five novels in the "Dante Valentine series" as well as other books. For the Valentine series, some of it is simple. I would love Fairuza Balk or Rachel Weisz as Dante, since both have that edge of competence. I would also, if I'm dreaming, like Cate Blanchett for the role, since Dante isn't traditionally pretty. For Japhrimel, I would pick Karl Urban. There's a scene in The Bourne Supremacy where Karl, as the bad guy, shoots Bourne -- and that, right there, is Japh. He's also got the correct eyebrows. Though I would love to see what Adrien Brody would do with the part. Christian Bale would be pretty to look at, but if push came to shove it would be Brody. He just has the talent to play a demon, you know. Other parts include: Kate Beckinsale as Gabriele Spocarelli, Tilda Swinton as Lucifer (the ONLY choice!) and Jason Statham as Jace. Giovanni Ribisi would be my first choice for Eddie, and as Santino? Brad Dourif. No question. Can you tell I'm a film buff too? The Dante Valentine series opens with Working For The Devil and closes with the fifth and final volume, To Hell and Back. Patricia Gussin is the author of Shadow of Death, which was nominated for Best First Novel in the Thriller Awards sponsored by International Thriller Writers, and the recently released Twisted Justice. The part of Laura would best be played by a mom-actress. A great choice because she is a dedicated mother and such a versatile leading actress is Gwyneth Paltrow. At the crux of the drama in Twisted Justice is a mother’s worst fear. Separation from her children is a visceral emotion for any mother, an emotion that would surely evoke genuine empathy from a woman who loves her children as much as Gwyneth Paltrow does. Steve turns out to be the character everybody loves to hate. He has his reasons, and because Twisted Justice is a mystery, they cannot be revealed here. Steve’s character could be played very well by Kevin Costner. He’s handsome, egotistical, yet insecure and vulnerable. It is Steve who sets off the downward spiral and tangled web of intrigue as he turns on Laura in the worst imaginable way when she is charged with Kim’s murder. As Laura’s fight for freedom dissolves into a bitter battle, pitting husband against wife, five innocent children are caught in the crossfire. Fourteen year old, Mike; eleven year old Kevin; ten year old identical twins, Natalie and Nicole; and the most victimized of them all, eight year old Patrick. Five casting opportunities open to young actors and actresses to play the children. It is difficult to imagine the pain that these kids go though as their parents’ betrayals and deceptions plunge them into a world of mortal danger. The action is fast paced in Twisted Justice. The emotional stakes are high. And just as in real life, justice can be twisted, but it is seldom ever thwarted. The last question: Who could best direct Twisted Justice? Steven Spielberg, of course. Sandra Parshall's "Disturbing the Dead"
Sandra Parshall is the author of The Heat of the Moon, winner of the Agatha Award for Best First Novel of 2006, and Disturbing the Dead, which came out in March 2007 to favorable reviews. I’m probably a rarity in that I have difficulty picturing actors playing my characters – with one exception. Meryl Streep would be a natural to play Judith, Rachel’s mother in The Heat of the Moon. I often clip photos of models from catalogs to inspire me when I begin writing new characters, but along the way my mental images diverge from those in the photos, and the pictures are discarded. “Casting” my second book, Disturbing the Dead, with models proved impossible because many of the characters are Melungeon – mixed race with dark skin and hair and, in a few cases, blue eyes. Some of my friends have no trouble naming actors to play my characters, and their choices remind me that writing long, detailed descriptions of the people in a novel is a waste of time, because regardless of what I write, every reader will see the characters in his or her own way. Kim nominated Kimberly Williams-Paisley from the Father of the Bride films and TV’s According to Jim to play Rachel Goddard, my young veterinarian heroine, because the actress has “an energy and enthusiasm I associate with Rachel” as well as the right physical appearance. True enough, but I could also accept Michelle Williams, suggested by Carol Baier, in the role. Who would I want to direct the movie of Disturbing the Dead? No contest: the Coen brothers. With them in charge, I could be sure the book’s brooding, rather gothic tone would be conveyed whole to the screen. To tell you the truth, though, if anyone made a film of one of my books I would have no expectations. A book is a book and a movie is a movie, and any similarity between the two is purely coincidental. Learn more about the author and her writing at Sandra Parshall's website. The Page 69 Test: Disturbing the Dead. In March 2007 Kristy Kiernan applied the Page 69 Test to Catching Genius, her debut novel. When I go to a baby shower I know that when they pass me a roll of toilet paper I'm supposed to tear off however many squares I think will go around the mommy-to-be's belly. It's an expected party-game, and I know how to play it. In much the same way, when I attend a book club function, I know that as soon as someone says "movie" I'm going to be asked to cast Catching Genius. Though it's an expected game, I haven't gotten nearly as good at it as I have the whole toilet paper/pregnant belly game. The truth is I didn't have actors in mind when I wrote the book. I envisioned sisters Connie and Estella, their mother June, the men in their lives, Luke, Tate, and Paul, and Connie's sons, Gib and Carson as wholly original beings. But after so many conversations about who readers thought should play my characters, I admit that I have finally given it some serious thought. For Connie, a mix of resentment and love on the edge of a dangerous boiling point, I like the idea of Robin Wright Penn. There's a lot of depth there that could be easy to overlook because of her beauty, just like Connie. For Estella, the damaged math genius who made her own life the way she wanted it (or thought she did), come on, who else but Jodie Foster? That scary intelligence mixed with vulnerability? Perfect! Plus she has the right hair for it. June, fiercely loving, but demanding and occasionally unsympathetic, with a shocking story about her past that she kept from her own daughters, I struggle with. I think Glenn Close comes, well, close, but I keep seeing Jane Seymour tilting her head, June's quasi-haughty move, just so and think she might be perfect. Luke, perpetual man-boy, whose infidelity pushes Connie over the edge, has a lot of contenders in Hollywood, but there must be a sad quality there, too, a history that he can't escape, no matter how much money he has, or how many baristas he fools around with. Possibly Rob Lowe? Paul, Estella's love, tall, rangy, gentle. Smells like wood shavings and varnish, dances with Estella standing on his feet so she doesn't have to touch the grout lines. He's lovely, isn't he? I'm thinking Anthony Edwards. And Tate, oh, all the women do love Tate. He's got problems, there's no question there, but he knows what they are, he knows where they came from, and once in a while he even owns up to them. Plus he brings fresh seafood over all the time and can build a bonfire. We need someone a little rough around the edges, someone with calluses on his hands who might take off to the woods for three days with nothing but a pocketknife. Luke Wilson has a quiet strength I like for Tate. Gib, the troubled teenaged son of Connie, infuriated with his father, uncertain of his mother, jealous of his younger brother. He's a good kid, but what's going to become of him? I think Jason Dolley, star of a series on the Disney channel, would be an interesting choice. And sweet Carson, concerned about everyone around him, into jazz clarinet and composing, unaware that he's a little prodigy. Nathan Gamble from Babel has just the right look, the right voice. And the director? Please, does anyone do dysfunctional better than Jodie Foster? Watch Home For The Holidays before you suggest another director. She is exquisitely talented and does sibling relationships beautifully. Visit Kristy Kiernan's website. Her new novel, Matters of Faith, comes out in August 2008. Sarah Langan received her MFA in fiction writing from Columbia University. She studied with Michael Cunningham, Nicholas Christopher, Helen Schulman, and Maureen Howard, among others, all of whom have been instrumental to her work. She is currently a master's candidate in environmental medicine at NYU. Earlier this year Langan applied the Page 69 Test to The Keeper, her first novel. I’d love for The Missing to be made into a movie, mostly because it would get more people to read the book. Also, I would become a rich and famous bizillionaire, and replace all my teeth with gold! For directors, and we’re talking crazy mad dream here, I love Marty (in my dreams, I call him Marty) Scorsese. He’d handle the violence in the book with honesty, so that it never got campy or gleeful. Also, he understands intelligent women. His actresses fight the camera until it sees things their way, while lesser directors are happy to fill the screen with pretty (boring) smiles. Under his direction, Meg and Fenstad Wintrob’s love would be poignant, and Lois’ bitterness sympathetic. For screenwriters, I love Brent Hanley (Frailty). He understands that horror comes from within, and his stories engage with the world. I’m also pretty thrilled with Ido Mizrahy and David Meyer -- the guys currently working on a screenplay (well, up until the strike) for The Keeper. As for actors, Philip Seymour Hoffman would make a great Fenstad. I think he’d bring a quiet turmoil to the role. Fenstad Wintrob is the town psychiatrist in The Missing. While he madly loves his wife Meg, their marriage is unraveling. A year previous to the opening of the novel, she engaged in a short affair, which she regrets. Still, she remains unfulfilled, and he’s miserable, because he can’t figure out why she can’t enjoy life now that their nest is empty, and they’ve finally got time to themselves. Actually, Donald Sutherland thirty years ago would have been perfect. Then again, when is Donald Sutherland NOT perfect? I wrote Meg’s character with Nicole Kidman in mind, mostly because Kidman is so frigging cool. But Maria Bello, Vera Farmiga, Linda Fiorentino, Rachel Griffiths, Carrie-Anne Moss, and Téa Leoni all have that same smart, type A sexiness that I envisioned for my heroine. She’s comfortable in her own skin, and accustomed to being in charge. Her weakness is her inability to be vulnerable, which I think is a nice twist, and more common than often gets written about. Lois Larkin is the hero-turned-villain, and probably the most fun to imagine casting. Upon being dumped by her boyfriend of seven years for her best friend, and losing her job, Lois’ personality takes a turn toward the dark side, and her carnal appetites are unleashed. She’s gorgeous, wounded, angry, and infected with a virus that allows her to read other peoples’ thoughts. I like Angelina Jolie for the role. She’s great in everything she does. Or Rita Hayworth — she would have been amazing! Also, I can only imagine the crazy stuff Rita put up with, while living with Orson. I like to imagine she was the genius behind the genius all those years. Learn more about The Missing at Sarah Langan's website. 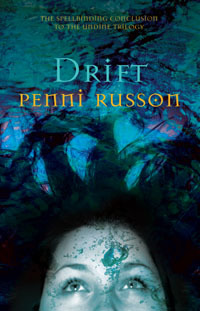 Tasmania-born Penni Russon is the author of The Undine trilogy, published by Random House in Australian and Greenwillow in the US, a series of magical books set in Hobart’s streets and the surrounding bush and seascapes. When I first imagined Undine as a movie (which was as I was writing the book!) I pictured it as a live action, but my four year old has recently fallen deeply in love with anime – films like My Neighbour Totoro, Spirited Away and Whisper of the Heart. When I started watching these with Frederique I definitely thought that it would be a great way to make Undine into a film. The dialogue in Totoro is some of the best I've ever heard in a film, the spirit of childhood is so perfectly captured. I think the Tasmanian landscape would be inspirational to a film-maker and Tasmania and Japan have a special relationship, maybe because we both know what it's like to see your country as fractured into islands – an image of Australia that 'mainlanders' don't share. So without further ado, here's the cast list, bearing in mind that because its animation, age doesn't matter so much! Richard: Hmm … someone from an Aussie soap probably (but I don't watch soaps). But someone young and smooth. I've mostly chosen Australians with international starpower because I want the movie to make LOTS of money. But Trout is a local, the first time I saw Richard Wilson on an ABC Kids show called Out There I knew he was Trout, he has the right blend of geeky and funny and vulnerable and self-possessed. Heath Ledger is exactly the kind of Australian boy I was picturing Grunt to be. I love Emilie as Clare in Lost, I love that she can look little and breakable but powerful and resilient too – her facial features are just right for Undine, so the illustrators should model Undine on her. Rachel Griffiths looks nothing like Lou but she would make a great Lou, she's got the energy and the shades of darkness Lou needs. Audrey Tatou would give Max an air of mystery (and not just because she has an accent!). I chose Sam Neill for Prospero just because I'd like to meet him. But I think he'd be great. The music by the way, would be mostly supplied by The Waifs. But Kate Rusby's song 'Who Now Will Sing Me Lullabies?' is Undine's song in Drift. It feels very naughty and fun playing this game! Now I should go and do something sensible. Sigh. Learn more about the author and her novels at Penni Russon's website and her blog, Eglantine's Cake. The Page 69 Test: Penni Russon's Breathe.